From the moment you step inside Museum Tower Dallas, an appreciation for beauty and luxury in all things is apparent. Museum Tower is proud to house an extensive art collection featuring the work of more than twenty renowned artists. The contemporary collection features styles ranging from the representational to the abstract and the pieces encompass various media: painting, sculpture, mixed media, ceramics, photography and works on paper. Tu Byl Mur Getta, 2011. Paint, newsprint, charcoal, paper on canvas. 55" x 110." Jonathan Allen has exhibited at numerous galleries and non-profit spaces in New York, including Lu Magnus, PS122, Socrates Sculpture Park, Artists Space, and BRIC Rotunda Gallery. He participated in the Lower Manhattan Cultural Council’s Workspace & Swingspace residency programs and the Bronx Museum of Art’s Artist in the Marketplace program, and has been awarded residencies at the Bogliasco Foundation in Italy, Cill Rialaig in Ireland, and Blue Mountain Center. A recipient of grants from the Pollock-Krasner, Puffin, and George Sugarman Foundations, his recent solo shows include exhibitions with Lu Magnus in New York, Real Arte in Italy, GoNorth in Beacon, and Buffalo Art Studio in Buffalo. He holds a B.A. in visual arts and art history from Columbia University. Learn more about Jonathan Allen. Elemental Topography, Edition 3/5, 2007. Cast iron and bronze. 48" x 96" x 30." Artist Erin Cunningham was born and raised in Kailua, Hawaii. In 2003, she received a Bachelor of Fine Arts from The School of the Art Institute of Chicago with an emphasis in small metals and sculpture. She went on to receive her MFA in Studio Art from the University of Texas in Austin. Since receiving her MFA in 2007 Erin has gone on to teach at multiple Universities. She was a Visiting Assistant Professor of Sculpture at University of Alabama in Birmingham and at Georgia State University in Atlanta. She has also been a Lecturer of 3D design and sculpture at University of Montevallo in Montevallo, Alabama. 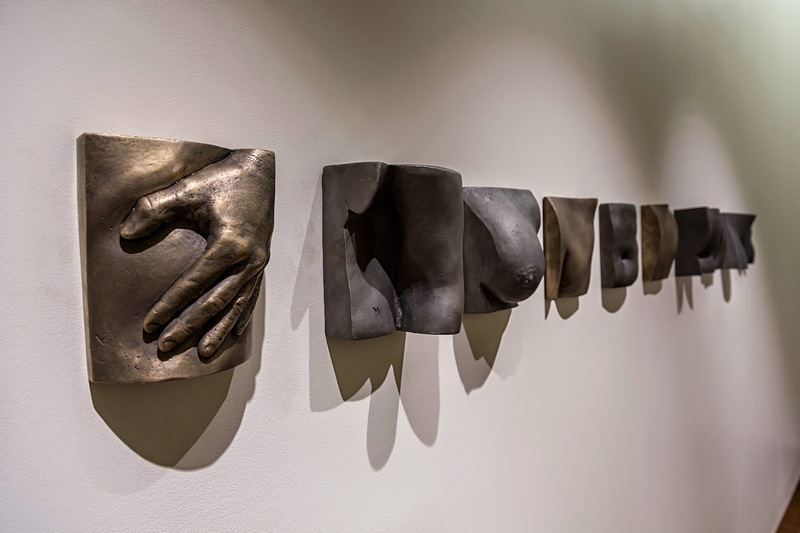 Erin has exhibited her sculpture and jewelry both nationally and internationally. She was included in the 2009 “New American Talent” exhibition at Arthouse in Austin TX, juried by Hamza Walker. Recent exhibitions include a solo show at COOP gallery in Nashville, TN and group shows at Martin Museum of Art at Baylor University and the Dishman Museum of Art in Beaumont TX. Erin was the recipient of an artist residency at BAER Art Center in Hofsos, Iceland. She has been a Visiting Artist in Residence at the Sloss Furnaces’ Metal Arts Program in Birmingham, Alabama. Perspectivism (Jaipur Landscape), 2009. Acrylic on canvas. 58" x 94." Erin Elizabeth Curtis was born in Albany, New York, in 1977. She attended The Glasgow School of Art in 1998 and graduated from William College with a BA in Liberal Arts in June of 1999. In May 2007, she received her MFA from the University of Texas at Austin, and she attended Skowhegan School of Painting and Sculpture in 2010. She has had solo shows at Conduit Gallery, Dallas, TX; Champion Contemporary and Women and Their Work Gallery, Austin, TX; Kashi Art Gallery, Kochi, Kerala, India; and Lawndale Art Center in Houston, TX. In 2008- 2009 Erin was a Fulbright Scholar in Jaipur, Rajasthan. She was in residence at Anderson Ranch in Snowmass, CO, during the winter of 2012. Learn more about Erin Elizabeth Curtis.